Welcome to Maremar, our luxury Costa Brava rental in Sant Feliu de Guixols with stunning sea views - only five minutes by car to the beach, water sports, shops, bars and restaurants. Imagine having 200 square metres of light and airy space for your family holiday, with two living rooms, one of which can be used as an extra bedroom with a proper, luxury bed (hidden in a wall space if not used)! Imagine having your own gardens on two levels overlooking the sea and the coastline, with six sun loungers available for your use. Imagine having the use of an oversized pool in a leafy oasis of calm which does not tend to get crowded (in fact, it is frequently absolutely empty) and in which you can have a proper swim, rather than just a splash about. This is what you will find at Maremar. At Maremar we have the best of all worlds - luxury, space, modernity, comfort, relative peace, enormous pool… but with easy access to the shops, the beachs and the rest of the Costa Brava, including the three major Salvador Dali buildings - his house, Gala's 'castle' and the Dali Museum itself. Our beautiful, very spacious, house is set in a discreet development next to beautiful pine woods and directly overlooks the sea. At 200 square metres of living space, it is one of the largest houses in the development, with living accommodation arranged over three storeys, and is of a high quality specification and design. It accommodates up to eight people very comfortably indeed with four bedrooms available. However, we limit occupancy to six deliberately as we want to keep Maremar comfortable and beautiful for guests. No sofa beds in the living room! The house boasts a very spacious living room with two three-seater sofas, dining area and full width glass doors leading out onto the large terrace and private gardens with their fabulous views along the coast of the Mediterranean and out to sea. There are dining tables accommodating six people comfortably both inside and out, although, in the spring, summer and autumn (and quite a lot of winter) you will doubtless want to spend most of your time outside. The American kitchen is modern and well equipped. It is especially good for convivial gatherings as the cook is not excluded from what is going on in the living room and beyond. We love to cook and have equipped the kitchen accordingly. The master bedroom is very large (the full width of the front of the house), with balconies overlooking the sea, the front gardens and the pine woods, and a luxurious en-suite bathroom in travertine and marble. The second, to the rear of the house, overlooks the landscaped gardens and the woods. It is a "normal" Spanish-sized bedroom with lots of storage. The optional 'rooftop penthouse'(!) double bedroom up on the second floor is virtually as spacious as the master bedroom and has direct access to the rooftop solarium, also looking out to sea. You can choose whether to use this as a bedroom, as another sitting room or, heaven forbid, an office! Finally, we have a spacious twin bedroom, overlooking the gardens with two single beds. This means that the accommodation can easily be configured to the needs of six people. So as to maintain the quality of this property, occupancy is strictly limited to six people. All bedrooms have deep luxury mattresses, duvets and the quality of linens that we like to use ourselves. As mentioned earlier, on the second floor, there is a private solarium where you can sunbathe in seclusion, looking out to sea from time to time and saying hello to the seagulls as they go by. The solarium is off a large space which can either be configured as the 'penthouse' bedroom or as a large chill out area. We have equipped the house for our own use. This means that we use high quality fixtures and fittings such as Bosch, Miele, Hansgrohe, Phillipe Starck etc. All rooms have been individually styled with solid oak flooring and high spec tiling etc. We have two lawned areas, one directly off the terrace and another down some steps, past the ancient olive tree at ground level. So you are spoilt for choice of aspect when it comes to sea and coastal views. At the rear there is a wide gated drive which will take two cars easily. It is flanked by borders containing native flowers, bushes and small trees such as an almond, a fig and a tall cypress (the local symbol of welcome). The communal pool is about 50 metres from the house and is about 20m long and six to eight metres wide (it is an unusual shape!). It is in lovely landscaped gardens with lawns (for sun bathing after a dip) and conifers. We have a 'pool box' which contains various pool toys/games which you are welcome to use. If you like to SWIM rather than just splash about in a tiny pool, then this is the place for you! There is also a paddling area to one side of it for tiny tots. Sant Feliu de Guixols is a mere 5 minute drive away or 15 minute stroll through the woods or along the coast road. In the summer months there is also a tourist 'train' which travels along the coast and up to the house, so you can easily get a lift down to the beach or the shops! We have had guests who have decided to base themselves completely at the house, sun bathing, swimming and taking the occasional stroll into town, with the most exciting thing they have done being the walk down some pretty precarious steps to the bottom of the cliff and the beautiful cove below. But if you are more adventurous or energetic there are many more things to do and see than you can cram into two or three weeks. You never have to stop! We have internet TV plus DVD. And our high speed Wifi access means you can stream whatever entertainment you wish to your own devices. And the Bose stereo system plus books and games available have been all that we have needed for a real chill out. The place is beautiful off season too, bringing other charms to bear such as the wild sea, the complete peace and the chance to use the fireplace in the living room. Sant Feliu's strapline is 'open all year round' and this is absolutely true with, for example, Carnival taking place in February. In April you can hunt wild asparagus in the woods and late summer is the time for a wild variety of mushrooms. We are close to S'Agaro, Platja d'Aro, Santa Cristina d'Aro and is close enough to, but far enough away from the big resorts of Lloret de Mar and Tossa de Mar. We love coming to Maremar ourselves. There is really not much more we can say! So if you want a luxury holiday rental in the Costa Brava, look at Maremar! About you We are a semi-retired couple who have a small number of properties (our house and two apartments) to offer our discerning guests from around the world. We love travel (the picture is us in Iceland! ), cooking, music from everywhere and the arts. We love passing on gems of information and little bits of what we call 'magic'. After all, it is these things that make a holiday memorable. We like to ensure that our guests have the best time possible at our properties and do not get dragged into the mundane aspects of staying in a self-catering property. The only shopping you should have to do should be fun! We have kitted out our holiday rental in the Costa Brava for luxury, comfort and peace which is just how we like the holiday rentals that we use. We hope you enjoy it as much as we do! Our luxury vacation rental on the Costa Brava, provides a luxurious, comfortable experience rather than a cramped one, giving you the very best of both worlds for a beach holiday. Sant Feliu, the town, the life and the beach are a very short distance away. But our house is in an oasis of relative calm, comfort and tranquility. Why did we buy it? The views, the views, the space, the location and the pool! Oh, and the views! Our guests say that what they love about Maremar are the details - comfortable mattresses with luxury mattress covers, real pillows and not just one each, basic foodstuffs already there so you don't have to go out and buy loo rolls, tea and coffee as soon as you arrive! We have modern, high spec appliances, coffee maker etc so that you can equally stay at home in the evening or go out into town. We stay here ourselves with friends so you won't be presented with just six of everything by way of cutlery, virtually no kitchen implements and the odd beer glass. Spoil yourselves a little! The pool is a big bonus. It is very large and hardly ever busy. So if you like a proper swim rather than a splash about, this is the pool for you. Having said that, there is a great paddling pool attached to it and a shallow end too so the whole family can enjoy the pleasure. You have clean sands, rocks with crystal clear waters, cork woods, pine woods, wild asparagus, posh shops all in one small area. You can stay put or wander around seeking art, history, architecture, nightlife, cuisine or whatever takes your fancy. We come here for our holidays and want to share the experience with like-minded people who want a little more from a seaside rental. Much more space, comfort and facilities than most other similar properties - or at least that is what our guests have been saying! For example, proper, deep mattresses, 100% crisp cotton sheets, large towels, good plumbing and the rest of it! 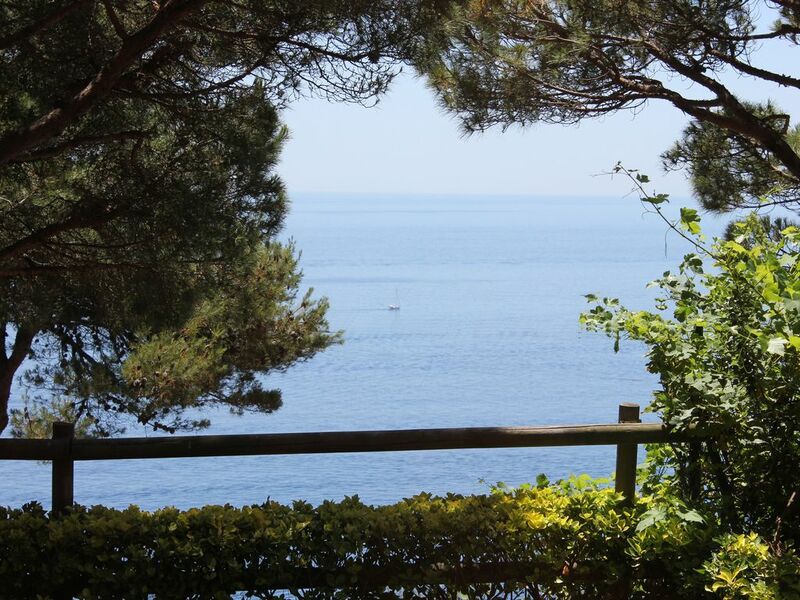 We have one of the most stunning views on the Costa Brava. So much so that travellers stop on their way into Sant Feliu especially to drink it in. Access to the guest only areas of our website which tell you what's on and where and also gives you lots of tips and ideas for things to experience, see, try and taste. Being self-employed, we always used to work from here. So the high speed, unlimited Wifi is reliable and the top floor can be used as the most charming, out of the way, office if you have to work! But it's also great for meditation, yoga, or just chilling out. High specification decor and facilities. Unparalleled, uninterrupted views of the sea and the length of the coast. Very large pool - excellent for people who want exercise and space rather than a place to splash about in. It is rarely crowded. All the benefits of a beach holiday without many of the drawbacks, noise, cramped surroundings, discomfort! With Sant Feliu de Guixols you have a real, authentic Spanish town and we can help you make the most of it. This is not a 'holiday resort' with all the attendant noise, bad behaviour and tourist traps, but it does have all of the amenities (except rowdy nigh spots). Many guests comment on how great it is to have an authentic experience but in a place where foreign guests are understood and welcomed. Finally, there are no hidden costs. None. At all. toilet, shower, Perfect for showering after a swim! All of the bathrooms are kitted out with luxury Porcelanosa tiling and fixtures (Hans Grohe/Philippe Starck) and fittings and designer showers (multi point in the en suite). As used by our family - largely John Lewis. Certainly not cheap, grubby sheets! Ours are crisp, 100% Egyptian cotton. Either duvets or “mantas” depending on the weather. Spare pillows too! Miele - very quiet! Detergent and softener provided. New for 2019. Probably a Bosch condenser. Not really needed in Spring/Summer/Autumn! Secure gated parking for two medium sized cars. Off street parking too. High speed wireless. No extra charges. Unlimited. Large and "fluffly"! 100% Egyptian cotton. The top floor room or patio can be used for yoga/tai chi etc.. We have yoga mats and exercise bands. There is lots of room for meditation and yoga. Pool a few seconds away. Very comfortable and spacious, looking out to sea through full-width French windows. Two three-seater sofas, library and games (mostly English language). Miele silent dishwasher with special glassware setting. Dishwasher tablets provided. Bosch fridge freezer with ample space. Bosch stainless steel hob with five rings. Bosch modern oven with self clean facility. Traditional Spanish percolating coffee maker. Cafetiere. Automatic 'barista' coffee machine taking capsules. Modern toaster plus toaster setting in oven. Full range of dishes, utensils and kitchen gadgets as this house is used by the owners and their family. Convivial American kitchen overlooking the living and dining areas. Modern fitted units. Lots of storage and kitchen equipment. Cable TV, international channels and films. Or can plug in your own devices for extras such as Netflix. High quality Bose CD player and radio. A wide variety. Mostly English language. We have organised Maremar for people who love each other to be together. Lots of games and room for a convivial time. Small selection of good English language films. But access to more through our TV subscription. You can also plug in your own devices to take advantage of home subscriptions such as You Tube etc. Two private terraced gardens to the front (south facing to the sea). Ancient olive tree and wild rosemary etc. Six sun loungers. Stunning views out to sea! Stunning views out to sea! Stunning views out to sea on three floors. Patio and gardens on the ground floor. Large balcony for the master bedroom. Enclosed solarium on top floor for private sun bathing and fabulous views. Very large with plants and herbs, plus lawns. Stunning views out to sea. Snorkelling equipment if left in good shape by previous guests. Really marvellous, extremely large, kidney-shaped pool 30 yds away, with separate paddling area. Set in landscaped gardens with ample sunbathing on the lawns. Very rarely busy and quite often empty! A really comfortable and homely feeling with luxury touches. The owners and their family visit this house quite regularly and maintain it as they would like to have it themselves. We provide cleaning on a weekly basis. There is a possibility to engage daily help if you wish at a modest additional cost. Fantastic Accomadation Full 5 Stars ! Firstly the property is in a lovely quiet location with stunning views over the med. A beautiful swimming pool is a mere 30 seconds away and is set in landscaped gardens. We went at the end of season so had it to ourselves and it was still plenty warm enough for a swim. The villa itself is equipped to a very high standard with literally everything you might need. The layout worked perfectly and the rooms were all good sizes and tastefully decorated. (The master bedroom is awesome with its en suite and balconies with gorgeous views to the front) The beds themselves were very comfortable and with the addition of air con throughout the villa it made for an excellent night's sleep. The owners were incredibly helpful, from us initially expressing an interest right through to us leaving to come home. We had a local power cut one evening and Peter rang the local electric company on our behalf and even offered alternative accommodation nearby. (Luckily it only lasted 90 minutes). Also despite arriving after midnight the owners had arranged for a local lady called Carmen to meet us and show us the basics, alarm etc. She also provided a welcome pack which was very much appreciated too. We would recommend a car if you're staying. Sant Feliu de Guixols itself is a traditional Catalan market town. It has many excellent restaurants, coffee shops and patisseries all a very short distance from the beach. We would recommend a trip to Sant Pol which is the next beach along. We caught the tourist train for 3 euros rather than walk it. The beach is lovely there has very soft sand and we can highly recommend the Maria Rosa restaurant on the front !!! As you can see by the other reviews Maremar is first class accommodation and you will not be disappointed. We hope to return in the future. We are really lucky to have such a large, swimmable (rather than just splashing) pool in our community. And, believe it or not, it doesn't even get very crowded in July and August because many of our neighbours are locals who don't use swimming pools! We have a photo on our listing of a guest and his son taken in August and they are on their own! We try to keep Maremar as homely as possible (for ourselves and for our guests). So we review everything at least once a year (including fresh licks of paint) to keep its standard as high as we can. Thank you for being such great guests (and patient and kind when the power cut in the area happened). We do hope that you will return to Maremar in the not too distant future! If you need quiet place with amazing view of the sea go to Maremar. Peter and Lucy will guide you through every details of your stay from road from airport to cultural events in the region .You will have clean house , very good equipped kitchen ,comfortable beds ,beach towels ,beds ,umbrellas etc . Access to big swimming pool almost without guests .Car is neccessary. Thank you for your lovely review - you are very kind! We think that the pool is a big plus point for Maremar because you can really swim in it rather than just splash about. Also, as you said, it seems to be empty most of the time, which is even better! You were fantastic guests and will receive a very warm welcome should you decide to return to Maremar in the future. This was the second year running we stayed at Maremar so that tells you how much we enjoyed it the first time!! Staying at Peter & Lucy's villa is just a wonderful experience from start to finish. Peter & Lucy are an absolute delight to deal with, nothing is too much trouble for them. Our silly questions were answered immediately and they spent an awful lot of time and effort supplying information for the more difficult ones. Our daughter had her birthday the day after we arrived and yet again Peter & Lucy had arranged a lovely surprise for her at the local patisserie. If there are better villa owners, I've yet to meet them. The handover of the villa works seamlessly with Carmen there to meet you on arrival and the villa itself is wonderful. Absolutely spotless and perfectly maintained, the sea views from all floors are breathtaking. The shared pool ( by shared there were never more than 3 other people and most of the time we had it to ourselves) is huge and warm and if the wind gets up occasionally, it's completely sheltered. We love St Feliu itself. The beach is great and never over-crowded and the sea is pleasantly warm. Snorkelling is far better than you'd expect (especially over by the rocks) and the area is lifeguard patrolled. There are so many good places to eat in St Feliu it's hard to know where to start. Cerveceria Hot Dog is way better than it's name suggests and tied with La Trinquet for serving the best octopus. La Vermuteria is all about vermouth (as the name suggests) and serves excellent tapas and sangria made with vermouth rather than red wine. Truly awesome and a knockout hit with the ladies in our party. When you need a break from tapas then the Italian restaurant La Locanda di Nonna Flo serves excellent pizzas. If you're adventurous our 12 year old did an introductory scuba dive with Piscis Diving in St Feliu and they were totally brilliant. Very professional and safety conscious, she loved the whole experience. We also visited Girona itself and what a lovely city. We did a guided walking tour and found it well worth it. Departure from Maremar was as easy as arrival. Carmen came to take the keys and that was it. Our damage deposit was back in our account before we'd even taken off from Girona airport. We're visiting my brother in Florida next year so we won't be returning to St Feliu unfortunately. If we weren't would we stay again at Maremar.? Of course we would!!!! What can we say?! Your review is just fantastic, and full of great information for future guests! As you know, we get a real delight in knowing that our guests have had the best time they can at Maremar - holidays are precious and rare after all. Once again, you were exemplary guests and we do hope that you will return to Maremar in the not too distant future. Maremar is a fantastic place for a family holiday. The house was clean, spacious, in a great location - and with amazing views! Peter and Lucy were really helpful from start to finish, and provide a really friendly but professional service. We enjoyed exploring the local area (including a visit to the water park! ), and several local beaches. We also found it easy to just relax at the house and make use of the wonderful pool. Thank you so much for your fantastic review! We are delighted that you love Maremar as much as we do. We hope you will return to Maremar in the future. Very clean, all you could need there. Excellent owner communication & information including what’s going on in the local area. Would love to return,would not hesitate to recommend. We hope that you will consider returning to Maremar in the future - you were fantasic guests! We had rented Peter and Lucy’s lovely home in Puligny-Montrachet several times, so we knew we wouldn’t be disappointed when we decided to rent at Maremar and see a different part of the world. The house is quiet, private, and tastefully and thoughtfully furnished and decorated, with simply gorgeous views of the Mediterranean by day and by night. It has everything you could want to make your own home comfortable: a very well-equipped, modern kitchen, an interesting selection of books, CDs, a barbecue, an electric plancha, roomy closets, very comfortable beds, and even beach towels, lawn chairs, yoga mats and snorkelling equipment. Peter and Lucy are the kindest, most helpful and thoughtful hosts imaginable. They are quick to respond to any question, have a website with all manner of useful information about the town and surrounding area, provide you with a detailed list of events in Sant Feliu and environs before your arrival, and their recommendations as to what’s not be missed are spot on. They even provided an updated list of local events halfway through our stay. We particularly enjoyed the gorgeous walking paths along the coast, the beautiful beaches, the farmers’ market in San Feliu, the wonderful fresh fish, and watching the annual fireworks competition at Blanes from a boat just offshore. The local museum in Sant Feliu is well worth a visit, as are the botanical gardens at Cap Roig. I found the pre-Roman Iberian walled town at Ullastret fascinating. But the once-in-a-lifetime event for me was the annual Correfoc in Sant Feliu, in which highly trained (and intrepid, I think) people run through the streets holding fireworks. You have to see it to believe it, but once you see it, you’ll never forget it. And I have to say, the same applies to our stay at Maremar. Thank you so much for beautiful, generous review! We thought that, if you loved 10pm in Puligny Montrachet, that you would probably love Maremar too, but you never know... So it was a delight to find that you enjoyed it as much as we do. Catalunya has so much to offer and Sant Feliu is such a great place to soak up the culture. We love to stroll down from Maremar to some event or other, or just a perfectly Catalan dinner with the freshest ingredients, and the stroll back up again (or perhaps take a taxi!). Sant Feliu caters specifically for walkers and bike riders, as well as some more exotic/extreme (!) sports, and we agree that the walks along the coast are stunning. Thank you for being such charming and thoughtful guests. You will receive a very warm welcome should you decide to return to Maremar in the future. Not your standard holiday destination with noise, crowds and dirt. A jewel in the crown of the Costa Brava, Sant Feliu de Guixols is one of the wealthier and more sophisticated towns of the coast. Unspoiled, although supported, by tourism, you get the best of all worlds - two beautiful beaches, great kiddies' areas, water sports, marina and fishing port, great golfing, pine and cork woods, dramatic coastline, daily fruit and vegetable and fish markets, and sophisticated shops and eateries. It is an authentic Spanish town frequented by the well-heeled of Barcelona and most people speak English and French as well. You can have all the fun and experiences but without having to deal with excessive noise, crowds and dirt. But you are not at all isolated with fabulous shopping and dining right on your doorstep! To top it all, it is a marvellous base from which to explore the varied and exciting experiences that Catalunya has to offer, from Greco-Roman settlements to the whole of Dali land, its fabulous fishing villages and coves, lakes and mountains inland and not to forget the delights of Girona and Barcelona! Our spacious luxury four bedroom home, arranged over three storeys, each with a spectacular view of the Mediterranean, is situated in a small, peaceful, yet modern development overlooking the sea just a short distance from the lovely town of Sant Feliu de Guixols (a fifteen minute walk into town through the pine woods or along the coast road). The house has its own private garden with an ancient olive tree and use of the communal facilities including an enormous, beautifully shaped, swimming pool (with separate paddling pool) in its own landscaped gardens. Our house looks out directly onto the Mediterranean so you can enjoy unparalleled views along the coast and out to sea, watching boats and cruisers go by in the distance and the fishermen's lights as their small boats serenely 'chug, chug, chug' at night. As you would expect, the small coastal road, with bits spectacular views goes off to the right and the left of Maremar. Sant Feliu de Guixols is a wealthy, staunchly traditional, market town on the Costa Brava. Although it boasts every amenity, it has a village feel about it with a fishing port, lovely beaches, rocky coves, a marina, a lovely tree-lined promenade and a maze of narrow streets in the old town centre. It has all the facilities you need but is unspoilt by mass tourism. It is popular with both Spaniards and visitors from abroad as it combines all the best that the region has to offer - sun and sea, fabulous food, a relaxed lifestyle, art and design, museums and historical monuments and easy access to everything. The curved sandy beach in Sant Feliu is wonderful, with easy swimming protected by the port's breakwater. And just around the headland to the next bay of Sant Pol lies another fabulous sandy curved beach where local celebrities come and moor their boats offshore to take the sun and swim and then eat in the wonderful restaurants along the beach front. And don't forget the multitude of coves you can get to down cliff paths or by boat, with the opportunity for snorkelling in the crystalline waters. It is only a short drive to each of the three Salvador Dali museums (the main museum in Figueres where a lot of his work is displayed, his house in Cadaques (which is a must see) and his wife Gala's castle/home in Pubol). The Greek and Roman settlement of Empuries is also close by, and the medieval villages of Peretallada and Ullastret. Or just visit the delightful Costa Brava fishing villages such as Calella de Palafrugell, Tamariu or Llafranch or the fishing port of Palamos. Platja d'Aro with its bustling night-life is only a 20 minute drive away. You will be spoilt for choice. The region is rightly famous for its food. In the Sant Feliu markets you can find locally caught fish, seasonal vegetables and fruit so self-catering can be a real delight. Or go to one of the many restaurants along the seafront promenade, on the main Rambla or in the narrow streets of the old town. Sant Feliu is a town that is alive all year round with a large weekly market, plenty of shops, restaurants and bars to cater for all tastes. It holds many festivals throughout the year and in July/August hosts a spectacular summer festival with live performances by top names in the specially erected tent by the port or in the Monastery Gardens. And if you fancy a trip to Barcelona for the day, it is only about 100km away (about 75 minutes by car) with bus services from Sant Feliu and easily accessible train services too. Security deposit of €350 1 week before arrival to cover for breakages (not normal wear and tear or the odd glass!) etc. Returned within 1 week (subject to T&Cs).